I cannot help remembering A.I.P.’s July 1977 movie of The Island of Dr. Moreau, with Burt Lancaster as Dr. Paul Moreau, the Mad Scientist who was uplifting animals into humanimals™, and downlifting humans into humanimals™. I don’t think that A.I.P. put out a single bit of publicity without emphasizing that humanimals™ was its own trademarked word. Fortunately, A.I.P. is gone now, and its trademark doubtlessly expired long ago. Miara Cooper is a cat-girl. Miara’s parents were hippies who took part in a scientific experiment in gene splicing before her birth. Now, twenty-four years later, society is still figuring what to do about Doctor Finchley’s and his colleagues’ essays into cat-people, dog-people, fox-people, bear-people and so on. Fuzzy Business, by Amelia Ritner, Seattle, WA, CreateSpace, May 2013, trade paperback $7.95 (271 pages), Kindle $1.99. Fuzzy Business 2: Fuzz Harder, by Amelia Ritner, Seattle, WA, CreateSpace, December 2013, trade paperback $7.95 (178 pages), Kindle $1.99. The government is nonplused but giving the humanimals (the polite term; fuzzballs is the non-PC term) the same protection under anti-discrimination laws that the more natural minorities have. There is the usual extremist hate group in the background; the Association for the Return to Human Purity (ARHP). Miara works for UPS in Northern California. One of her deliveries is to a big, fancy house with nobody home but a murdered body on the floor. The body is that of the founder of the ARHP. Miara just catches a glimpse of a coyote-man escaping; one of Her People. The local police offer her protection as an important witness, but they can only guard her for four days. During that time, Miara meets a wealthy, handsome human, Connor Griffith, who seems to more than like her despite her feline features. But as soon as the police protection leaves, she is kidnapped by the coyote-man she saw fleeing from the victim’s house. Except that he insists that he didn’t do it He’s being framed by the real murderers; a gang of criminal humanimals called the Mammal Mafia. And Coyote-Man – John – wants her to help him prove his innocence. Okay. 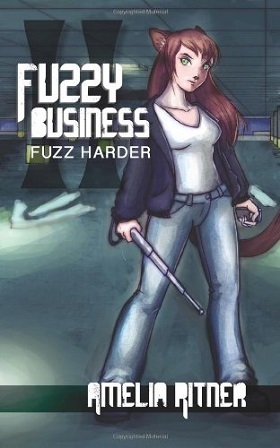 If Fuzzy Business were dunked in any more feminine pheromones, it would read like a furry paranormal romance. Miara, as expected, decides to trust John despite the apparent evidence against him - he doesn’t “smell” guilty. And his appearance as a handsome biker hunk coyote-man doesn’t hurt any. “And it didn’t help that he could smell you." "Well I – wait. Do I smell?" John teaches Miara to use and trust her feline instincts more. As the plot progresses, Miara comes to believe in John – but is this her instincts at work, or is she developing Stockholm Syndrome; bonding with her captor? Meanwhile, Connor is determined to rescue her. Should she be helping him, or is there a loyalty among humanimals? Should she ask Connor to help them? The list goes on at length. Just who is Connor? All is well until she gets involved with a new anti-humanimal hate group that makes the ARHP look like pansies. The People Against Genetic Exploitation (PAGE) are clever enough to use an innocuous name, and they deliberately only attack humanimals based on large predators like cougar-men who look dangerous. But PAGE’s actions reveal them as para-military sadists who enjoy ganging up on isolated victims and stomping them with steel-toed boots into a hospital, or worse. Miara’s defense of a humanimal victim at her mall makes her a special target for PAGE. John and Connor are determined to defend Miara, but they are hampered by pro-humanimal activists who insist on recruiting Miara into their groups. And PETA. There is also confusion caused by some restaurants and hospitals that refuse to allow humanimals in, on the reasonable grounds that their fur would make the establishments liable for health-law violations. As with Fuzzy Business, Fuzzy Business 2 could be rewritten fairly easily into a novel about entirely human ethnic or racial prejudice, but the amount of detail about the “Animal-Americans” (who rightly note that they are mostly human with only a light veneer of animal traits) will please most Furry fans. There is a brief dating of the stories as taking place in the second half of the 21st century, but both books are really set in the present, with references to nothing beyond 2000 car models and slightly older movies and TV shows like Ghostbusters, Star Wars, The Terminator, South Park, Baywatch, Japanese anime (with cat-girls, natch), etc. This is semi-covered by making Miara a fan of classic rather than current (future for her) movies and TV, but the two novels still feel like the-present-with-furries. I don’t think that furry fans will object. Both books have pleasing covers by Randi Racine. At only $7.95 each, $1.99 for the Kindle editions, you can’t go wrong. But maybe you should wait for book 3. Considering the cliffhanger ending of Fuzzy Business 2: Fuzz Harder, there will certainly be one.